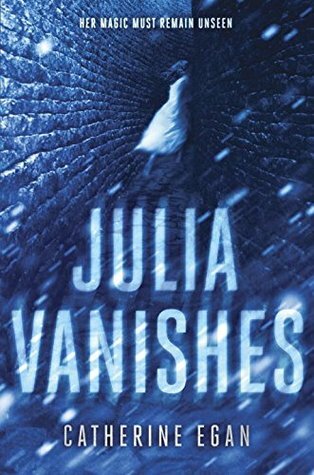 Julia Vanishes is best labeled as historical fantasy with a distinct Victorian feel. Julia lives in Spira City, where servants are generally illiterate, witches are killed publicly and regularly, and propriety is the highest priority for everyone. Egan provides wonderful descriptions of Julia’s surroundings, without them being a burden for the narrative. While not exactly atmospheric, Julia Vanishes is deeply dependent upon its detailed setting. Julia has the marvelous ability to remain unseen. She can choose to make herself extremely difficult to notice, which makes her career as a thief and a spy somewhat easier. Even though she’s only sixteen, she’s a very skilled actress and mole, known for her ability to discover even the best hidden secrets. As a character, Julia remains mostly hidden during the first half of the book. Perhaps there’s just too much going on and we have to struggle to keep track of the rapidly expanding world, but it’s not until a major emotional event that we understand more about our invisible spy. Once Julia becomes clear in our heads, we can’t help but admire her fearlessness and strength. We also can’t seem to forget that she’s only 16 years old, and so very capable of taking care of herself. It is not in my nature to turn away. Not I – I look my nightmares in the eye. And if my nightmares should look back, they see nothing but shadow. I am not there. Julia struggles with her ever-changing circumstances. Witches are a known enemy in her world, hunted and drowned by the hundreds. But Julia, whose mother was a kindhearted witch, knows that the world is not black and white. Once she begins uncovering other secrets of the world and finding other paranormal creatures, her perspective changes rapidly. Through it all, Julia is so accepting, so difficult to surprise and scare, and even when she is scared, she handles her fear well. There is a big journey for her in this book, a road of mistakes and redemption and it would have been easy to judge her along the way. But Julia quickly lands on her feet and works toward forgiveness. There is very little actual romance in Julia Vanishes, but there is plenty of growing up and learning to handle disappointments. Some things, although left unacknowledged, might develop into something more in the future. If it does go that way, Julia might end up with someone worthy and wonderful, intelligent and honest. This book isn’t part of the Thriller Thursday feature for nothing. It is very exciting at tense at certain times. The monster that cuts its victims’ heads open is truly terrifying, but no monster can be worse than humans. Julia faces danger from several sides, and the action that takes place will keep you at the edge of your seats. Several things were left wide open in the end, with only one thing abundantly clear: Julia’s future will be vastly different from her life in Esme’s gang. Better things might be ahead of her, but her strange ability and her connections pretty much guarantee dangerous and exciting times. The next book can’t come soon enough! So excited you liked this, I have a copy and have been curious about it. OOoh nice! Was curious about this one when I kept seeing it around! Sounds like an intense read that I will have to keep an eye out for! Great review! I read Kim's review for this one and immediately knew I needed to pick it up. It sounds terrific and rather unique too. I love a good historical fantasy, and I think I'd actually like that there's little romance even though I'm a romance junkie. I'll push this up my TBR. This is very interesting. So does she have the ability to cloak herself in the invisible woman kind of way? I don't think I've read of such a book before. Alright..I actually have this but hesitated because I thought YA, romance, but wowzer...this sounds fantastic! This sounds very good but while I'm a plot girl at heart, I hope the characters aren't lis within the complicated world and plot. If they shine through in the end than it would be a great read. I had not heard about this book at all before, but it does sound very intriguing Maja, I might just have to give it a try! I am mostly just excited that you have Thriller Thursday - somehow I had missed that. I have read tons of thrillers this summer so going to go check out some of your back posts.